This is one of the largest Neolithic cairns in Argyll. It is over 24m in diameter and up to 4m high. It stands in trees on the northern edge of the Moss of Achnacree, a few kilometres north of Oban. During excavation in 1871 three chambers and a long entrance passage were found. Now, only part of the inner compartment's capstone is visible from a hollow at the top of the cairn. Fragments of Neolithic pottery and white quartz pebbles were found in the chambers. 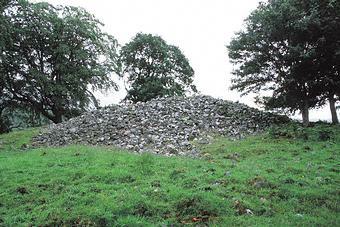 The much more denuded chambered cairn of Achnacreebeag (NM 929 363) lies to the east.